Disclaimer: I’m completely ignorant about selling shoes (Al Bundy would probably know better), so don’t mind if I completely missed what matters in this business. As I said before, it might be possible to analyze this info with other products (although often with limited possibilities), but here we’ll show how you can do that with Web Log Storming. 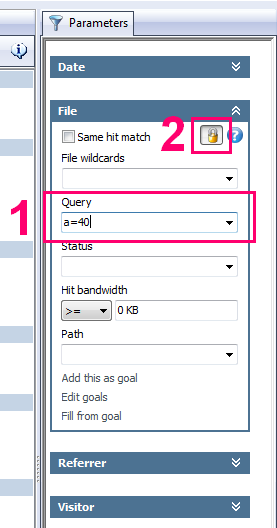 Type a filter into Query parameter (for example: “a=40″) and hit Enter. Whatever report you have active at this moment, it will now be based on visitors in forties only. There is lot of questions which all make sense to me, but I’ll just stop – if someone told me month ago that I will spend this much time thinking about shoe market… Besides, I’m sure you understood the importance of visitor segmenting by now and that you know what questions relate to you business.